Simplify the secure management of smartphones, tablets, laptops, wearables and IoT devices. Enable thousands of users and devices to access your network with confidence in your mobile security. Enroll and onboard new devices. Restrict usage or push apps and content out to your mobile environment. Track hardware and software, and dynamically deploy security policies as device posture changes. "IBM offers one of the most feature rich EMM solution"
"Cisco’s differentiators include an intuitive and visually appealing UI that allows administrators to create device, policy, and user “tags,” eliminating the need for manual policy creation"
IBM MaaS360 provides unified endpoint management (UEM) to intelligently manage desktops, laptops, tablets, smartphones, and the Internet of Things (IoT) from one platform. Offers MDM capabilities across all major computing platforms, including iOS, macOS, Android and Windows devices and supports legacy windows platform from legacy Windows XP SP3 to the current Windows 10. Manages the minutiae of mobile events and delivers cognitive insights, contextual analytics, and cloud-sourced benchmarking capabilities. VMware - AirWatch Enterprise Mobility Management is a secure enterprise platform that delivers and manages any app on any smartphone, tablet, or laptop. AirWatch provides unified endpoint management allowing you to manage the entire lifecycle of any endpoint. It offers full device management for corporate-owned, app-level management for BYOD, or line of business use cases such as kiosk or shared devices. 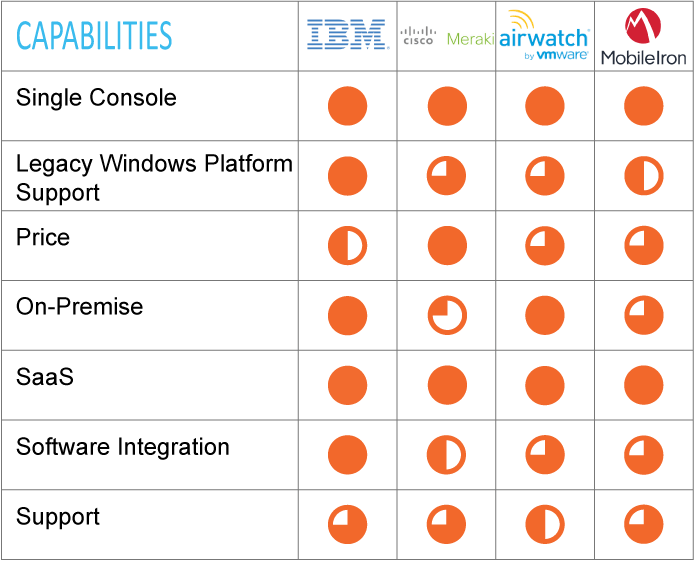 AirWatch manages Android™, Apple® iOS, BlackBerry®, Mac® OS, Symbian® and Windows® devices from a single admin console. MobileIron EMM platform provides management and security software for mobile apps, content and devices including Android, iOS, macOS and Windows 10. The platform secures data-in-motion as it moves between the corporate network, devices, and various on-prem and cloud storage repositories. It allows IT to set mobile policies and integrates with backend enterprise IT platforms such as Active Directory and can be deployed on premise or in the cloud. Cisco Meraki provides a cloud solution for centralized device management so you can have visibility into your entire network from a single dashboard. Supports iOS, Android, OS X, Chrome OS, and Windows phone. Seamlessly on-boarding new devices and automate application of security policies. Enroll and provision users, monitor their devices. Integrates well when Cisco/Meraki is the primary infrastructure.